The inner layer of the high voltage cables for X-ray machine. Each core wire is composed of multiple strands of fine copper wire. The insulation of the outer insulation skin is required to withstand 50Hz and 1000V ac test for 5min.There is an insulating cover between the cores. The high-voltage insulation layer, outside the central cable, is the main insulation layer of the high voltage cables for X-ray machine, which is made of rubber and chemical raw materials with a thickness of 4.5-13mm. With good mechanical strength and physical property, it can be bent within a certain range, and the pressure resistance is generally 50-200kv. Semiconductor layer. Close to the insulation layer, made of semiconductor materials and adhesives, gray-black, 1-1.5mm, to eliminate the electrostatic field between the outer surface of the insulation layer and the metal shielding layer. 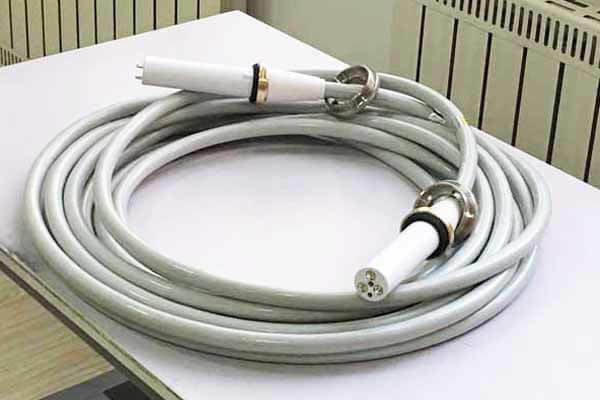 Newheek high voltage cables for x ray machine is divided into 75KV and 90KV according to the degree of pressure resistance.The length of the high voltage cables for X-ray machine can be customized according to customer needs to meet different customer needs.